You must still remember about our christmas project which is collaborate with UNICEF and Lee Min Ho right ? Nah, here I want to promote some merchandise. It's a unique wallets from Prada and Louis Vittoun. It's not too expensive With buy one of these, you've just donated for UNICEF and helping Lee Min Ho to collect funds which will be donated to unlucky children in this world. Louis Vittoun brand with purple colour. There are 3 slots for keeping your mobile phones, 4 slots for your card, and 2 slots for saving your money. The price is IDR 145,000 or US$ 14,5. For Jakarta, Indonesia and around Jakarta ( Bogor, Depok, Tangerang, and Bekasi ), you are FREE from delivery charge. But if you're in outside Jakarta and around, even in another country, we will put a delivery charge on your bill. This is the complete colour version of the models above and the price is IDR 135,000 or US$ 14,5. For Jakarta, Indonesia and around Jakarta ( Bogor, Depok, Tangerang, and Bekasi ), you are FREE from delivery charge. But if you're in outside Jakarta and around, even in another country, we will put a delivery charge on your bill. 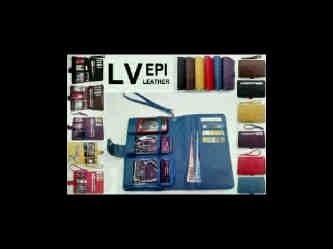 Louis Vittoun Taiga brand with assorted colours. There are 5 slots for keeping your card, 3 slots for keeping your mobile phones, and a slot for saving your money. 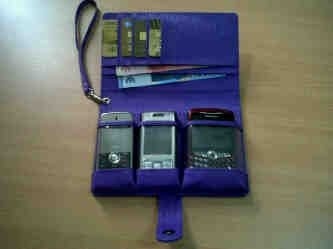 Uniquely, you can make this wallet as a mini bag and it's so cute ^^ The price is IDR 170,000 or US$ 17. For Jakarta, Indonesia and around Jakarta ( Bogor, Depok, Tangerang, and Bekasi ), you are FREE from delivery charge. But if you're in outside Jakarta and around, even in another country, we will put a delivery charge on your bill. 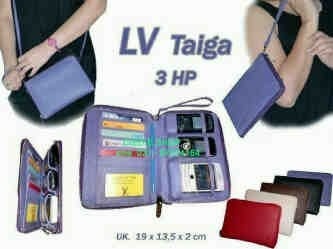 Louis Vittoun Taiga brand with assorted colours. 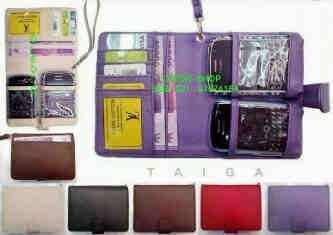 There are 4 slots for keeping your cards, 2 slots for keeping your mobile phone, and 2 slots for saving your money. The price is IDR 170,000 or US$ 17. For Jakarta, Indonesia and around Jakarta ( Bogor, Depok, Tangerang, and Bekasi ), you are FREE from delivery charge. But if you're in outside Jakarta and around, even in another country, we will put a delivery charge on your bill. 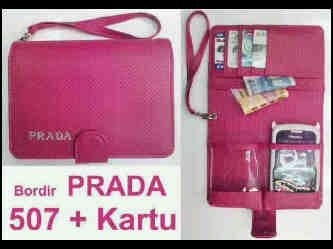 Prada brand with pink colours. There are 2 slots for keeping your mobile phones, 4 slots for keeping your cards, 2 slots for saving your money, but no slots for putting a photo. The price is IDR 120,000 OR US$ 12. For Jakarta, Indonesia and around Jakarta ( Bogor, Depok, Tangerang, and Bekasi ), you are FREE from delivery charge. But if you're in outside Jakarta and around, even in another country, we will put a delivery charge on your bill. For sending the stuffs, we will use TIKI if you're in INDONESIA. But if you're not in INDONESIA, we will send it by FEDEX or later we can confirm it. Ask us about the delivery charge. WE REALLY HOPE THAT YOU CAN HELP US BY BUYING ONE OF THEM. BECAUSE THE PROFIT IS NOT FOR US, BUT REALLY FOR HELPING UNLUCKY CHILDREN IN THIS WORLD. WE ARE COLLABORATING WITH UNICEF AND LEE MIN HO.